Chavez reveals personal side, criticizes U.S.
(CNN) -- Venezuelan President Hugo Chavez revealed a deeply personal side in an interview Thursday night, saying he loves Jesus Christ and would have liked to play Major League baseball in Yankee Stadium. 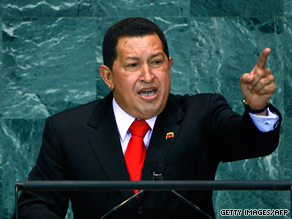 Venezuelan President Hugo Chavez spoke highly of President Obama at the United Nations on Thursday. He also expressed a fondness for American people and culture, saying he likes the movie actor Charles Bronson and the poet Walt Whitman. He loves to sing, he said, though he does not do it well. And Chavez had kind words for the U.S. security detail protecting him during his visit to New York, saying he chatted with them while out walking and that they "have been very gracious, very efficient and very attentive, very kind." In an exclusive interview with CNN's Larry King, Chavez spoke at length about a host of issues: relations between Venezuela and the United States and his hopes for improved ties with President Barack Obama; Iran, Israel and those who deny that the Holocaust existed; efforts to overthrow him and have him assassinated; criticism that he is power hungry and trying to silence critics. When asked whether he is misunderstood in the United States, Chavez seemed to turn reflective. "I'm a man with many defects," he said. "I love. I sing. I dream. I was born in the poor countryside. I was raised in the countryside, planting corn and selling sweets made by my grandmother. My children, my two daughters are with me and I want a better world for my grandchildren, for your grandchildren. "Now, they demonize me. But that's the start of these world campaigns to try to defend what you cannot defend -- a system that is destroying the world. ... I'm a Christian. I want the world of justice and equality. This is the only way to achieve peace." Chavez then talked about his religious upbringing and current faith. "I was an altar boy," he said. "My mother wanted me to be a priest. I am very Christian and Catholic. ... I'm very faithful. I believe in God, in Jesus Christ. I love Jesus Christ. I am a Christian. ... I cry when I see injustice, children dying of hunger." His comments were all the more remarkable because Chavez and the Catholic Church have been at odds since he came to power in 1999. The church has been one of his major critics, with Pope Benedict XVI and other church leaders expressing concern over what they see as attempts by Chavez to limit the church's influence. Chavez's efforts to change anti-abortion laws have been at the top of those concerns. Chavez, in turn, has referred to church leadership as a "tumor." Speaking of other matters, Chavez said he hopes for improved relations with Obama, but "we want relations based on respect, relations of peoples where we are respected." That has not been the case so far, he said. "Most governments in the United States in a hundred years have not respected the peoples of Latin America," Chavez told King. "They have sponsored coup d'etats, assassinations. It's enough. We want to be brothers and sisters. We want respect and equality." "The Bush government toppled me," he said. "They asked for my assassination. They disrespected us. ... I saw my assassins. ... I was a prisoner in Venezuela, being a president. They took me to the seaside. I was debating with those who wanted murder me. They received the order to kill me. However, at this very moment, a group of soldiers refused. They did not kill me, but I saw those who wanted to kill me, and the order came from the White House." Chavez also expressed concern that the United States, which he calls "the empire," still would like to topple him. As he has numerous times in recent weeks, Chavez criticized U.S. plans to begin operating out of military bases in neighboring Colombia. The United States says it needs a presence in Colombia to fight drug traffickers. Chavez sees a sinister intent. When asked what country he fears would harm him, Chavez replied, "The empire. The empire. Seven military bases ... in Colombia, that's a serious threat against Venezuela." Chavez also defended his relationship with Iran but denied having said that Iran would help Venezuela obtain nuclear technology. Iran has embarked on a nuclear program that the United States and other nations think will lead it to develop nuclear weapons before long. "They have fooled you," Chavez said. "I've never said that Iran is going to help us to have nuclear technology. ... That's a strategy to attack Venezuela and say that we are building an atomic bomb. That's the next accusation. And I'm going to say this now: Please, come on. That's crazy. That's crazy." Chavez said he does not agree with Iranian President Mahmoud Ahmadinejad's contention that the Holocaust, in which 6 million European Jews were killed during World War II, never existed. "But there also was another holocaust in South America," Chavez said. "I do not deny the Jewish Holocaust. And I condemn it. But in South America, when the Europeans arrived, there were close to 90 million Indians; 200 years later, we only had four million remaining. That was a holocaust. And the Europeans denied this holocaust." Israel came under criticism from Chavez, who called it a "small country with atomic bombs, and very aggressive country. ... They have massacred entire families. It is a war-mongering country." Turning to the situation in his own country, Chavez denied that he is trying to shut down critical media, such as the independent Globovision TV station. Government officials have levied several charges against the station, saying that it is disseminating false information and trying to foment dissatisfaction against Chavez. The Chavez government has repealed licenses for other independent TV and radio stations, and has threatened to do so against Globovision. Former U.S. President Jimmy Carter this week joined human rights groups and others who have expressed concern over what they see as Chavez becoming too authoritarian. Chavez dismissed the criticism. "Never in Venezuela have we had so much freedom of speech as now," he said. Pressed by King about whether he is going to shut down Globovision, Chavez answered, "I do not know. It depends on them. If they keep on sponsoring coup d'etats, if they keep on calling for my assassination, if they keep on breaching the law even as well, it is not Chavez that's going to close them. I want to apply the law. We need to respect the law. It is the law. It's out of logic, and it's pure logic." As to Carter, Chavez said, "Yes, I read that and I regret for him, because I think he's totally confounded and lost. It's a long time since he visited us. I respect him enormously, but I think he is wrong. He's a victim of so much falsehood in the world."